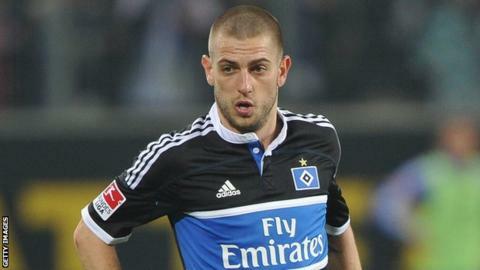 Fulham have signed Croatian striker Mladen Petric on a free transfer after his contract with German Bundesliga side Hamburg expired. The 31-year-old, who has scored 12 goals in 44 international appearances, joins the Cottagers on a one-year deal. He previously played under Fulham boss Martin Jol during the Dutchman's time in charge at Hamburg. "I'm very happy to be part of what is happening at Fulham," said Petric. "The club is doing very well." Born: 1 Jan 1981 in Dubrave, Brcko in Bosnia-Hercegovina. Clubs: FC Baden, Grasshopper, Basel, Borussia Dortmund, Hamburg. Petric, who scored against Fulham for Hamburg in the semi-final of the Europa League in 2010, added: "I like the Premier League and it has always been one of my wishes to come here. "I played with Hamburg against Fulham two years ago in the Europa League. It was very nice to play at Craven Cottage with a fantastic crowd and I have enjoyed a good relationship with every member of the club I have met since. "I know the manager well and I know that he is always looking to strengthen his attacking options and I hope that we can do even better next season." Petric started his senior career in Switzerland with FC Baden. He joined Grasshopper in 1999, making 114 appearances for the Zurich-based club before moving to Basel in 2004 where he scored 38 goals in 72 appearances. He spent the 2007-08 season at Borussia Dortmund before signing for Hamburg, for whom he scored 38 goals in 98 appearances. Petric scored the winning goal in Croatia's 3-2 victory over England at Wembley that ended Steve McClaren's side's hopes of reaching the finals of the 2008 European Championships.